SEDRO-WOOLLEY, Skagit County — The interior secretary environmentalists have loved to hate stunned wildlife advocates and conservationists at a morning news conference here Friday, in which Ryan Zinke threw his support behind grizzly bear recovery in the North Cascades ecosystem. “The grizzly bear is part of the environment, as it once was here. It’s part of a healthy environment,” he said, effectively reigniting an Obama-era grizzly recovery study that was halted early during the Trump administration. Cattlemen were incensed, stating they have already faced too much carnage from the return of the wolf to Washington. But Zinke — reviled among public-lands advocates and conservationists in Washington for everything from backing oil drilling off the coast to hiking national park fees — said he is convinced that park and wildlife professionals can “get it right,” and deliver an environmental-impact statement and record of decision by the end of the year under which the federal government will return the grizzly bear to its primordial home in the North Cascades. 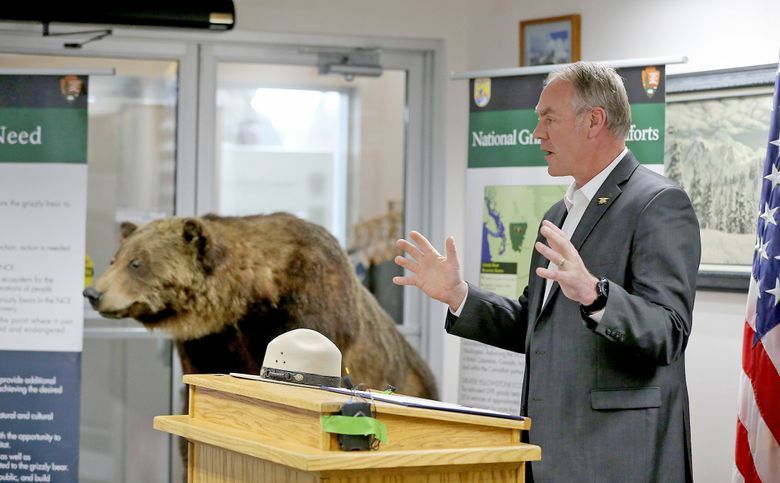 Zinke said the process would take the concerns of public safety and the worries of cattlemen into account with a decision that would manage the numbers of grizzly bears returning to their mountain redoubt, a sprawling wilderness where the bear is at risk of local extinction. He spoke at the administrative headquarters of North Cascades National Park with a stuffed grizzly behind him. Speaking before a small group of media and wildlife and parks activists, Zinke took only one question before departing. Doing it wrong can adversely affect visitors hiking the park and other users, “but I am confident we can reintroduce the grizzly bear back to this ecosystem. “We are extremely disappointed with the Department of the Interior’s stated support for introducing grizzly bears to the North Cascades of Washington,” Ethan Lane, Executive Director of Federal Lands for the National Cattlemen’s Beef Association said in a prepared statement. “For more than a year we have heard the secretary talk about being a better neighbor, but unfortunately actions speak louder than words. Reintroducing as many as 200 man-eating predators into an area already reeling from exploding gray-wolf populations is anything but neighborly. But it is time, Zinke said, for land managers and public-lands advocates to look ahead 100 years, and connect wildlife corridors and landscapes. And yes, bring back the great bear. “I am confident we have the skill to have grizzlies in the ecosystem in a way that managers don’t have unintended consequences,” he said. With that, he walked from the podium, leaving a room full of stunned wildlife advocates, momentarily speechless. “I am waiting for the other shoe to drop, but there isn’t any,” said Joe Scott, a grizzly bear specialist with the nonprofit Conservation Northwest, which has long supported the bear’s recovery in the North Cascades. “Let me catch my breath,” said Mitch Friedman, executive director of Conservation Northwest. “Nixon went to China. Zinke is going to bring the grizzly bear back to the North Cascades. Rob Smith, regional director of the nonprofit National Parks Conservation Association office in Seattle, said it is time now to make sure the decision that emerges from the environmental-impact statement process reflects the wholehearted commitment to restoration of the bear to its home. “This is a green light, for all the work that has been done so far, and it is what we hoped an interior secretary would say about this program,” Smith said. “It’s a ringing endorsement, but at the end of the year, it all depends on the final decision how successful this will be. During the news conference a small group of protesters demonstrated outside, carrying signs such as one reading “At least the war on the environment is going well!” They all burst into cheers when they heard the news of Zinke’s announcement. The National Park Service, the Fish and Wildlife Service, and other cooperating agencies have already developed a draft environmental-impact statement and conducted numerous public meetings on recovery of Ursus arctos horribilis, the grizzly bear, in the North Cascades. The grizzly recovery study was originally announced during the Obama administration in August 2014 as a three-year process. In mid-2017 Interior officials, without clear explanation, halted progress on the recovery efforts. With his remarks Friday, Zinke has kicked the process back into gear. Over 126,000 comments and correspondence were received on the alternatives already studied. The comments will be analyzed and addressed to be included in the final environmental-impact statement, which is tentatively scheduled for release in late summer. Zinke previously served in the Montana state Senate and as a U.S. representative from Montana. A former Navy SEAL, this was his first official visit to Washington state since his appointment to lead the Interior Department by President Donald Trump.